If you have questions about our news articles, or if you are meeting Schoenstatt for the first time, or don’t know its wonderful and colourful variety, you can turn to us. It is possible that we won’t know the answer, but we can sometimes put you in touch with someone who can. This is a service we offer – and selfless service, including the time involved, is something Pope Francis brought home to us during our Jubilee Audience. It is simply part and parcel of what we do. We are there for you and your questions, big or small. Jesus was the great master of wasting time. We aren’t quite as good at it as he was. Yet, even if dozens of email arrive each day, we try to answer them as soon as possible. Since we publish so many articles, some think we are a big team. We are. Yet all our collaborators work voluntarily online from home next to their work, family and apostolate. That is why we don’t always manage to answer all questions immediately, and sometimes we don’t manage at all. If we are to deal with the important matters, please understand that we are usually unable to deal with questions about accommodation, making or cancelling orders for periodicals or books, or providing a search service for photos or older articles. Please apply directly to the competent bodies – and have a look on this webpage for the information provided. Someone in Rio de Janeiro once asked us when the bookshop at the shrine was open. With a few emails and phone calls one of our collaborator in Brazil found the information required, only to discover that the person concerned live a few streets away from the shrine. Sometimes you will get a quicker answer to your question where you are. Just look at the map of Shrines HERE. You will find the most important data there, at a glance. Please also note that for reasons of data protection we may not pass on email addresses and private telephone numbers. If you are looking for a mail or telephone number, which appears on this webpage, the telephone book, at Facebook or where ever people share their personal data, you will save us a lot of time if you look for them yourself. It will save us a lot of that time we would prefer to spend doing the editorial and translating work for the interesting articles we publish. Thank you! And now, yes, what can we do for you? For hints, questions and comments to the Editors, and questions about Schoenstatt and how to make contact please use the following online form. Please give us you name, address, and above all correct email address so that we can answer you. This is not a prayer group! For prayer requests please turn to the different prayer and adoration groups, your local shrines or the “network that prays”, www.mayfeelings.com, or use the Direct line to the Original Shrine (straight to the heart of the MTA, NO prayer group). 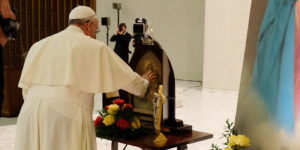 Attribution includes the author and/or translator, as well as Schoenstatt.org as the source. For orders, changes or cancellation of subscriptions to periodicals or information you receive from Schoenstatt, please contact/inform the competent publishers. Thank you! Subscriptions or cancellation of subscriptions to our newsletter, or changes to your newsletter address can be done either via the Link under each newsletter, or HERE. Questions about accommodation, travel arrangements, bookings, addresses and general information about visiting Schoenstatt, please check under Visitors’ Information under SERVICE, and use the addresses provided there. You will find a lot of information under SERVICE that could help you find what you want.